"Then Baruch read from the book the words of Jeremiah in the house of the LORD, in the chamber of Gemariah the son of Shaphan the scribe, in the upper court at the entry of the New Gate of the Lord's house, in the hearing of all the people." "When Michaiah the son of Gemariah, the son of Shaphan, heard all the words of the LORD from the book, he then went down to the king's house, into the scribe's chamber; and there all the princes were sitting; Elishama the scribe, Delaiah the son of Shemaiah, Elnathan the son of Achbor, Gemariah the son of Shaphan, Zedekiah the son of Hananiah, and all the princes." The previous passage also mentions another scribe, Gemariah the son of Shaphan. His clay was found in 1978. The inscription reads: "Gemariah, son of Shaphan"
The third clay seal that was found is inscribed with the name of king Jehoiakim's son, Jerahmeel. It reads as follows: 'Yerahme'el, son of the king.' He is recorded in Jeremiah 36:26. "Thus says the LORD of hosts, the God of Israel: 'Go and tell the men of Judah and the inhabitants of Jerusalem, "Will you not receive instruction to obey My words?" says the LORD . . .
"I have also sent to you all My servants the prophets, saying, 'Each of you must turn from your evil ways, and reform your actions, . . . But you have not listened, nor obeyed Me. "Therefore thus says the LORD God of hosts, the God of Israel: 'Behold, I will bring on Judah and on all the inhabitants of Jerusalem all the doom that I have pronounced against them; because I have spoken to them but they have not heard, and I have called to them but they have not answered." 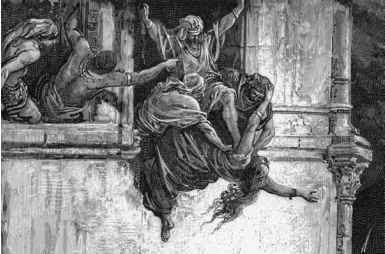 "And the king commanded Jerahmeel the king's son, Seraiah the son of Azriel, and Shelemiah the son of Abdeel, to seize Baruch the scribe and Jeremiah the prophet, but the LORD hid them." God's judgement came to pass in 597 B.C. when Nebuchadnezzar king of Babylon removed Jehoiakim's son from the throne, took him captive and replaced him with Jehoiakim's brother Zedekiah. Later, in 586 B.C., Nebuchadnezzar marched against Jerusalem and destroyed the city. "For God so loved the world that he gave his one and only Son, that whoever believes in him shall not perish but have eternal life. For God did not send his Son into the world to condemn the world, but to save the world through him. Whoever believes in him is not condemned, but whoever does not believe stands condemned already because he has not believed in the name of God's one and only Son."